I suppose it was inevitable that this would happen; the new hotness, free-to-play MOBAs, combined with that most tired of standbys, zombies. 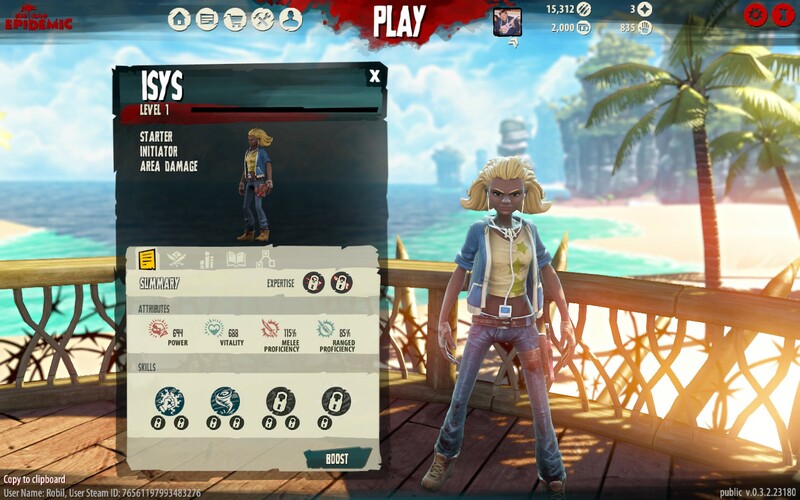 Dead Island: Epidemic, a spin-off of the middlingly popular, first-person action-RPG series Dead Island, is currently in closed beta on Steam, and this week I spent six-or-so hours slaughtering the undead on its sandy beaches. Despite its cynical genre-mashing, it’s hard to really dislike Epidemic. A lot of that is down to its charming looks. The series’ tropical island setting is brighter and more colourful than ever, with a chunkier, more cartoonish art-style, and character and enemy designs are imaginative and fun. It’s a welcome contrast to the dull grey-browns of the average zombie apocalypse. The gameplay too makes a decent first impression. Epidemic takes its cues from the likes of League of Legends and Dota 2, but tries for a more ‘direct control’ approach. A top-down perspective with a skill bar, but combined with manual aiming and WASD movement. Accessibility is clearly the goal, and it works – bashing zombies is immediately satisfying. Currently there are two main modes. The first is a co-operative horde mode, which sees your team of survivors moving up the map capturing points, defending them against waves of zombies, and ultimately facing off against a powerful boss monster. 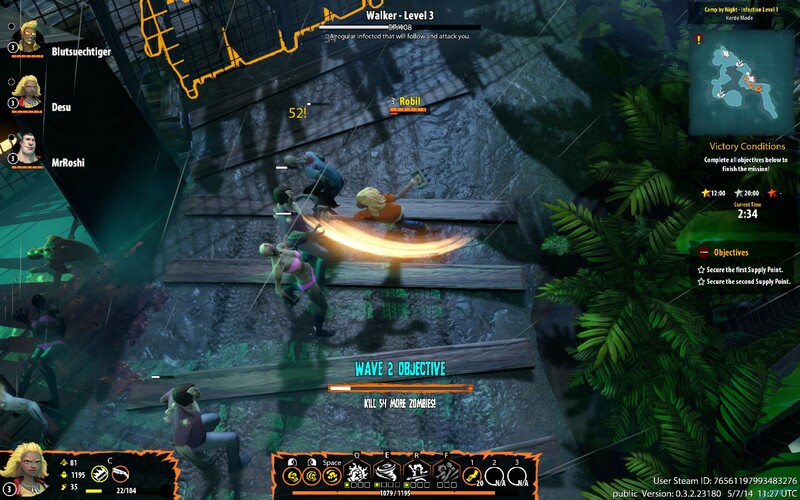 It’s more than a little reminiscent of classic zombie co-op game Left 4 Dead, with a lot of familiar enemy types forcing you to guard each other’s backs closely. One that grabs you with a long tongue and pulls you in, one that charges and stuns you, one that pounces on you and holds you down, and so on. It’s not original, but it’s a decently engaging challenge. I did find the boss design a little too difficult and frustrating, but I dare-say that could be the result of playing alongside mute strangers online rather a coordinated group of friends. The second is ‘Scavenger’, a player-vs-player mode that pits three teams of four survivors against each other in a race to gather valuable supplies. 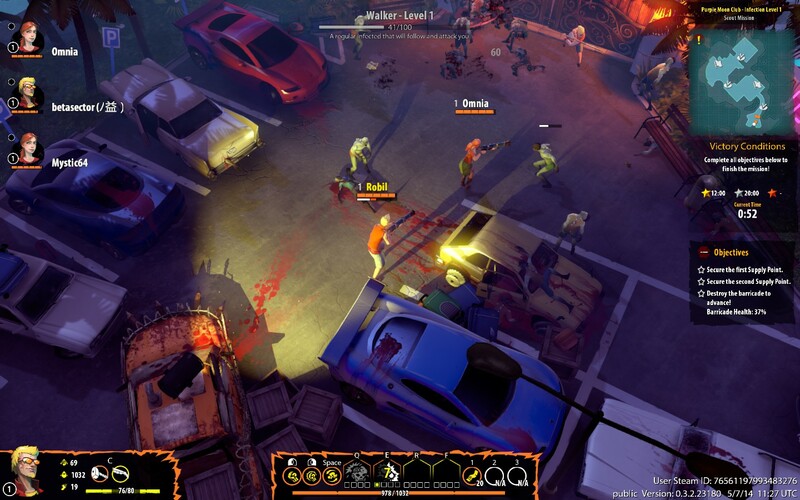 The map is littered with zombies and boss monsters, guarding the much needed resources. While players are free to engage each other in combat, the smart thing to do is to focus on taking down and looting monsters as quickly and efficiently as you can, while interfering with your enemy’s ability to do likewise. Veterans of LoL and Dota 2 will recognise the format – what it feels most like is the ‘jungling’ system of those games, spun-off into its own thing. While both of these modes are decently fun, there’s no real meat to them, and it’s hard to imagine a real community forming around them. I suspect new modes will be added soon, adding at least variety, if not true depth. The most unpleasant aspect of Epidemic is pretty much exactly what you’d expect it would be – its free-to-play sensibilities. With countless currency types and even more progress bars and meters, it’s an ugly and distracting implementation of the business model, and unfortunately it does impact on the gameplay. Character’s abilities, weapons and equipment are gated by out-of-game equipment, granting an unfair advantage to those with more time to grind or enough money to skip ahead. It’s an unforgivable sin for any game that hopes to build a competitive following, and if it’s not tweaked in the coming months it could well be Epidemic‘s undoing. With work, Dead Island: Epidemic could be a fun little twist on the genre, but I doubt it’ll be the money-spinner publisher Deep Silver are surely hoping for. With a new MOBA announced seemingly every week, I’m not sure Epidemic‘s endearing visuals and accessible controls will be enough to distinguish it from the horde.